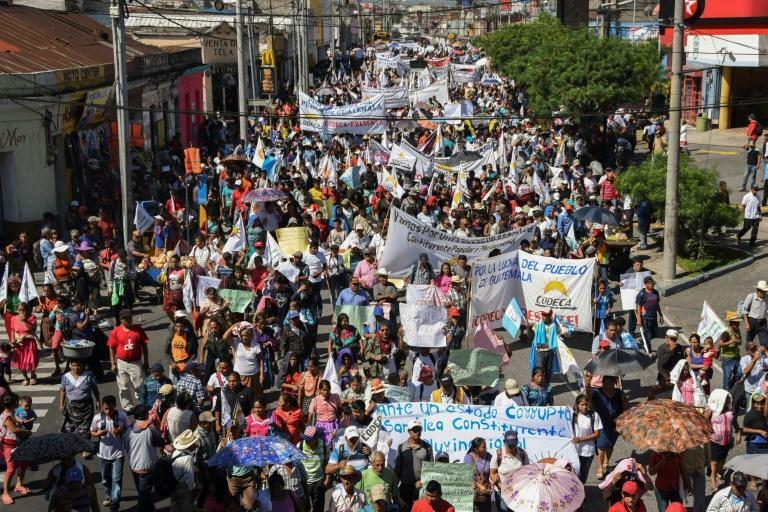 Thousands of Guatemalan farmers marched peacefully in the capital Wednesday demanding that President Jimmy Morales quit and that a UN-backed anti-corruption office get a new lease on life. The protesters filed through Guatemala City to the central square in front of the Palace of Culture, the former seat of the government. Morales, a former television comedian, said in late August that he would not ask the United Nations to renew the mandate of its anti-corruption office, known as the International Commission against Impunity in Guatemala, or CICIG. The office, which works with Guatemalan state prosecutors, has twice asked for Morales' presidential impunity to be lifted so that it can investigate corruption allegations surrounding his 2015 election campaign. Just days after he cancelled the anti-graft investigators' mandate, Morales banned the head of the commission, Colombian Ivan Velasquez, from entering the country. Demonstrators on Wednesday carried placards reading "Ivan Velasquez, the people need you," "We demand the resignation of Jimmy Morales and 158 lawmakers," and "No more corruption, CICIG stays." The march coincided with a ceremony presided by Morales in the nearby congress building marking 197 years since the country's independence from Spain. Dozens of police officers and soldiers lined the streets near congress to prevent the marchers from trying to enter the building. CICIG and state prosecutors have presented evidence that Morales' FCN-Nacion party failed to report nearly one million dollars in financing to electoral authorities during his successful 2015 presidential campaign. Set up in 2006, the mission is an independent body with investigative and prosecutorial powers. Its success in tackling corruption has inspired calls for similar bodies to be set up in other Central American countries. Morales came to power on an anti-corruption pledges after his predecessor, Otto Perez Molina, was forced to step down and face corruption charges in 2015.